Lost Levels :: View topic - The Berlin Wall (Mega Drive) Lost Levels - A website about unreleased video games. 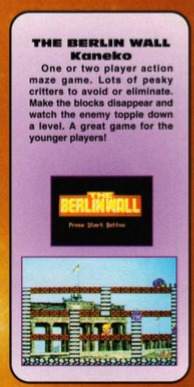 Before it was retooled and released as Wani Wani World, there was a proper version of The Berlin Wall for the Mega Drive that resembled the arcade original and the Game Gear port. Turns out that the EGM guys also took quite a lot of video footage at the Tokio Toy Show in May '91, which includes the full intro of the game! I'm sure you noticed, but around 4:12 is actual footage of the infamous Sphinx mini boss from Rockman 4. BMF speculated on twitter that it may have been cut for difficulty concerns. It sure looked cool though. Supposedly "consoles that didn't include Sonic the Hedgehog" was how they described the compatibility.